Milkweed Montessori in your inbox! Enter your email address to follow Milkweed Montessori and receive new posts by email. 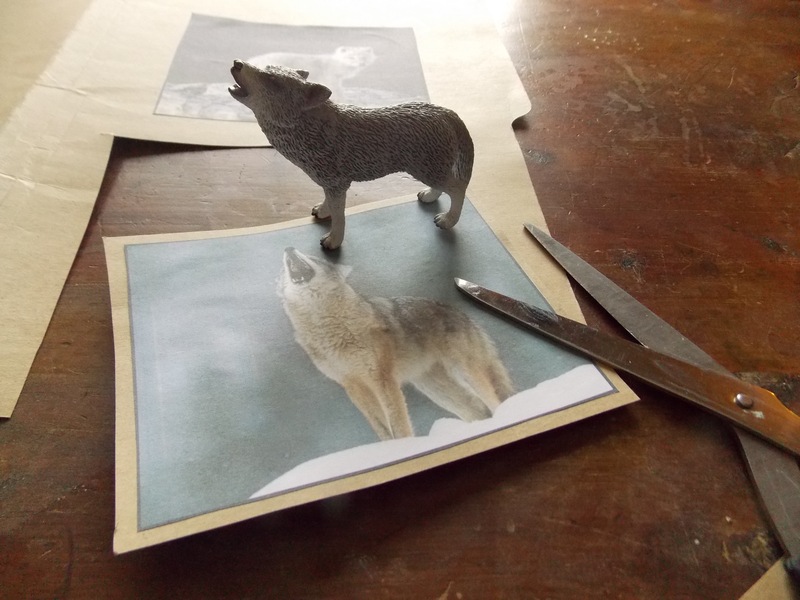 This week I worked on a fun project to add another dimension to one of Jasper’s favourite materials — the Schleich forest animals. Around the web I’d seen photos of toddlers matching each lovely, realistic model animal to a lovely, realistic image on a card. 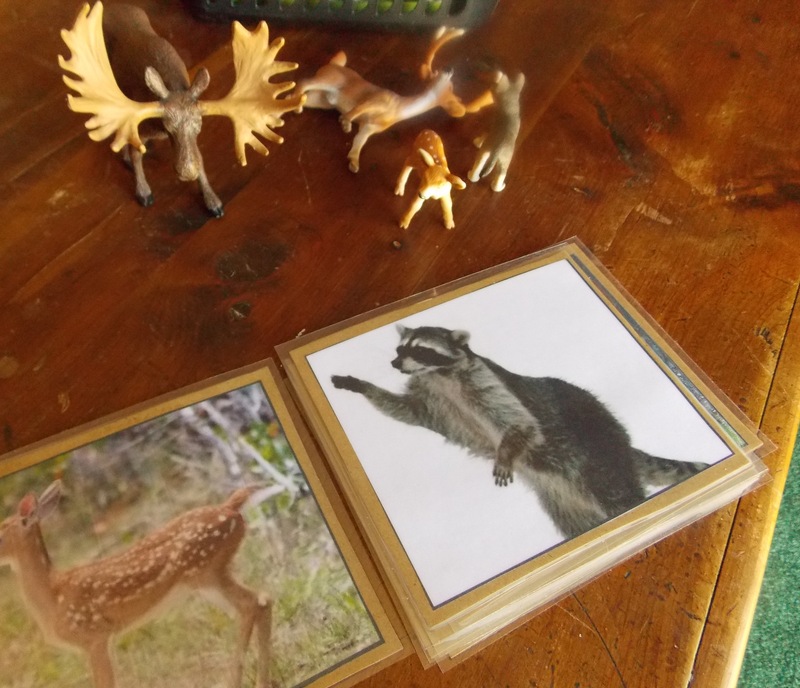 I’ve even seen something similar for sale in the lovely How We Montessori shop, which features three sets of cards: one with a photo of the plastic animal, one with the animal in its natural setting, and one with only a silhouette. If you’re closer to Australia than I am, go for it! Since I am sadly still in the throes of the Northern Hemisphere’s winter, I made my own. 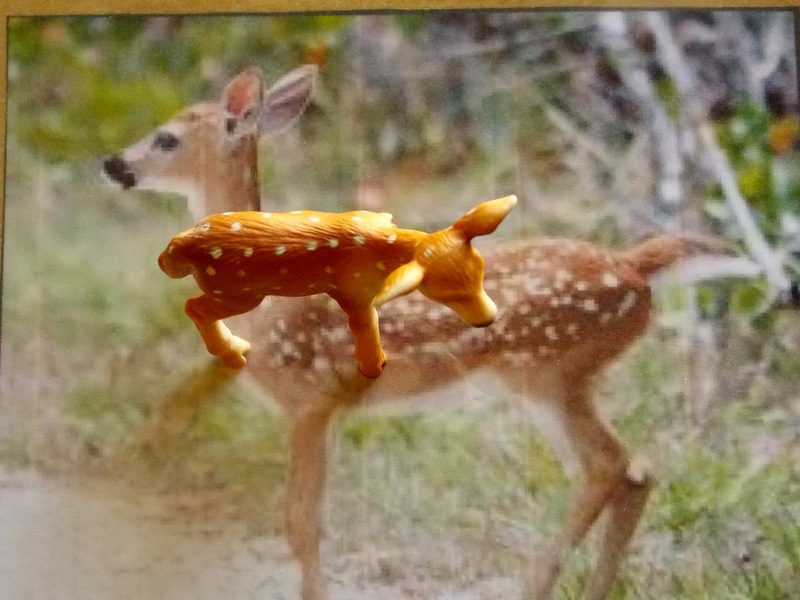 I used images of the animal in a setting, but tried to replicate the position of the Schleich animal (i.e. the adult wolf is howling). This material provides some wonderful opportunities for learning. 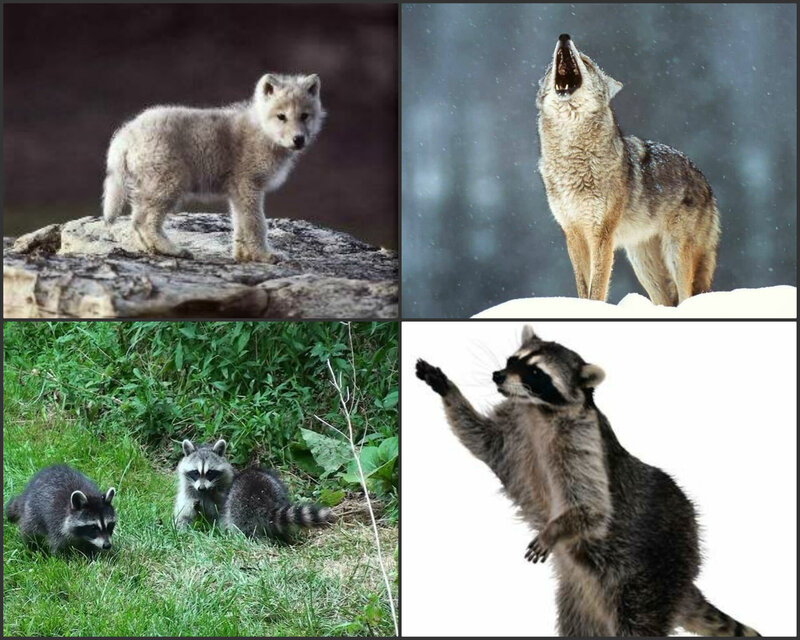 First I downloaded some good-looking wildlife photos found online, and made a little collage out of them using a photo editor. Collaging isn’t neccessary, but it sure cuts down on wasted paper. I printed the pages in landscape mode. Then I cut simply cut along the lines, and pasted the images onto some stiffer card stock (in the interest of saving even more paper, I used old file folders we had around). 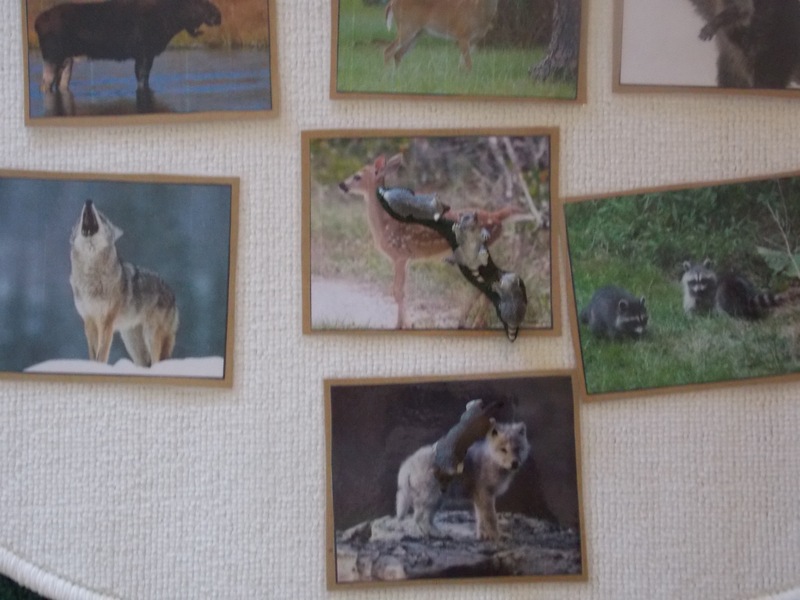 Next, I cut out the images, leaving a small border of cardstock around the edge. Then I had the cards laminated. You can do this at home, either using laminate sheets or a machine, but I had mine done at Staples and it cost $8 and was zero stress. It’s not totally necessary to have your cards laminated, but it will infinitely extend their lifespan. Don’t forget: toddlers! There you have it! 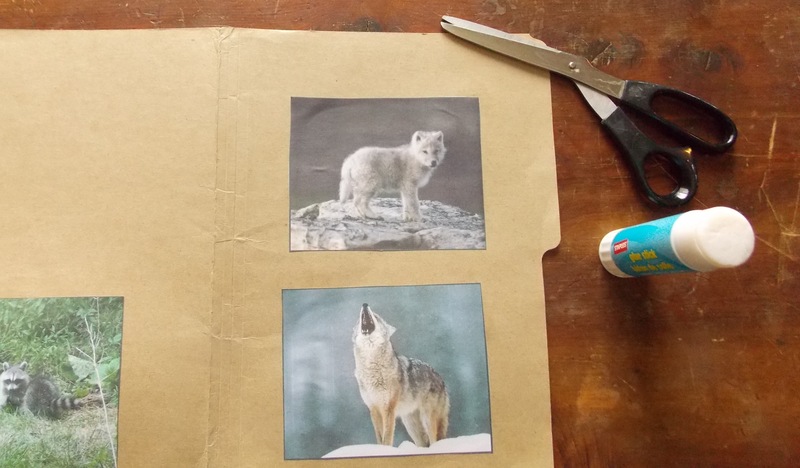 Your very own homemade-but-still-totally-awesome animal cards. In the photo below, you can see them in action, complete with authentic incorrect raccoon kit placement! Edited to add: Beth, from Our Montessori Life, has left a wonderfully detailed explanation of how to present the animals and cards. I highly recommend checking out the comments below, and adding your own voice to the conversation! Thanks so much, Beth! I’m pretty sure Quentin is one of the kids I’ve seen doing this work. Any tips on how to present it? I presented it to Quentin starting with just the cards. I named them and let him examine them. I kept it to only 3. Then I would ask him where the cat was and he would point (kinda like a 3 period lesson). Then I printed a duplicate set of 3 cards for matching. When he had become good with that I introduced the animals. Just 2 cards and two animals at first. He quickly got it and I increased the card/animal match by one until he was using a whole set. We do it on his work mat with the cards in neat lines. I found this was the difficulty with too many cards in the beginning. It was overwhelming for him to look through so many options to find a match. So we started with two cards and then went up from there. Hope this helps. I haven’t done forest animals with him but they are next on my list. Oh wow, thank you so much for taking the time to explain this so well, Beth. Very helpful! I think starting off with fewer moving parts makes a lot of sense at this stage. What a lovely set of cards!!! Thank you for sharing great job 🙂 Pinning them!